Exploring nature is a wonderful way to learn about the plants and wildlife that live in our ecoregions. Start by exploring the nature in your back yard and local park, and when you are ready to explore a new location, there are lots of options. Here are some hikes, parks and other interesting areas to visit for a dose of nature in the Baton Rouge area and further out. BREC has a wonderful listing of their walking, biking, hiking and running trails. They even have a blueway water trail. The primitive trails in BREC's Conservation Areas are beautiful! Please note that some of these areas do not have amenities. Hiking trail descriptions and maps by local hiking expert, Eric Hebert. 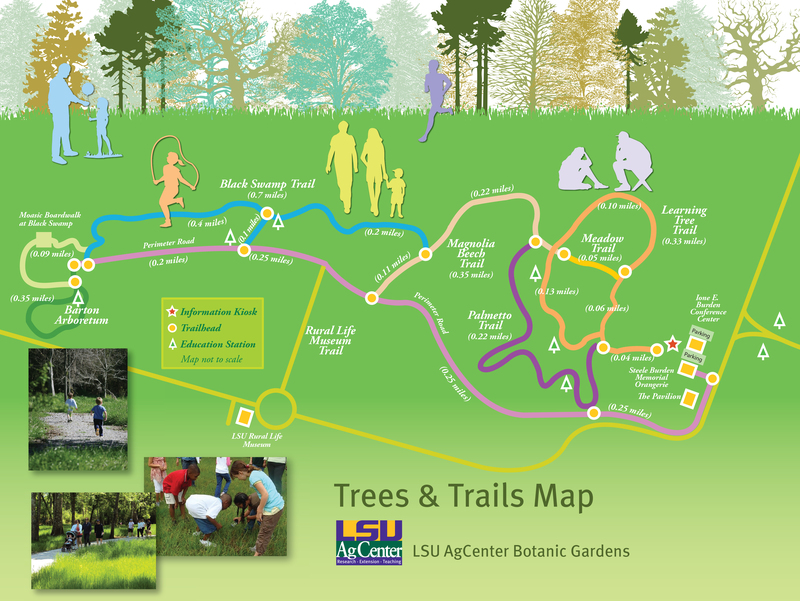 This path runs 12.5 miles along the river levee between downtown Baton Rouge and L'Auberge Casino. The path goes past the Water Campus which holds the LSU river model and past the LSU main campus (ride your bike to the games!) The 8 mile stretch between Farr Park and L'Auberge Casino is gravel, but it is going to be paved soon. Keep in mind that since it is a levee, there are no trees on the path to provide shade, though there are tall trees along the water which the birds love. 103 acres of beautiful swamp with trails and boardwalks in the heart of Baton Rouge. In the main building, there are live animals on display, touch tables, helpful staff and a little souvenir shop. They host lots of family-friendly events. There are bird watching walks on Saturday mornings. The Waddill Outdoor Education Center off of North Flannery Road has 237 acres of swamp habitat with walking trails and fishing ponds. A great place to see frogs. Bottomland hardwoods in the Atchafalaya basin. The state refuges and conservation areas are mostly on the Gulf coast, and are critical habitat for birds. This forested preserve is in the Tunica Hills of West Feliciana Parish and features 2 miles of walking trails. The U.S. Fish & Wildlife Service manages several National Wildlife Refuges in Louisiana which are teeming with birds and wildlife. This designated scenic byway is a 180 mile journey into one of America’s “Last Great Wildernesses.” You can see alligators, over 400 bird species, marshlands teeming with life, natural Gulf of Mexico beaches, plus fishing, crabbing, Cajun culture and more. The All Trails app and website helps you find trails for outdoor adventures for any skill level. There is supporting information like maps, reviews, pictures, and more.